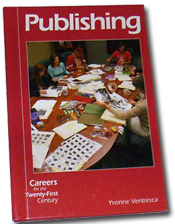 I had the pleasure of contributing to Yvonne Ventresca’s book, Publishing: Careers for the Twenty-First Century. Check it out. Your reputation . . . and mine! by letting just “anyone” design it! S E R V I N G . . .
As a self-publishing author, you need someone who can not only create a beautiful and properly designed book (interior and cover) for you, but someone who will take care of all the details in helping you throughout the entire self-publishing process. I’ll take care of you, and your book! I did books by them or about them! For references, ask those who have worked with me . . .
playwright, journalist and new media producer. Niamh van Mienes, CEO of Practitioner Solutions, author. David Kolatch, publisher, Jonathan David Publishers, Inc.
Larry Koenig, author, speaker -- Smart Disicipline. Glenn Yeffeth, publisher, BenBella Books, Inc.
COMING SOON: MY STORY . . .
Building books is what I do! On June 7, 2009, we lost a very special man, a dear friend, and mentor. Irving “Perk” Perkins was a gifted book designer and owner of IPA - Irving Perkins Associates (book design) and Pagesteers, Inc.(Typesetting) companies. I worked for Perk for several years as a book designer and layout artist. While under his tutelage, I designed nearly a thousand books, learning from Perk a lot about the true art of book design. IPA designed books for most of the major publishers in NYC (Simon & Schuster, Crown, Harper Collins, Bantam Dell, etc. ), among many other publishers. In the early years, we drew each page design by pencil, writing out (what seemed like endless) specs for every element in the book. In the later years, we developed a method of creating typeset designs, eventually leading to what is now InDesign. We will miss Perk, not only for his talents as a book designer. compositor, and fellow golfer, but mostly as a friend. I owe a lot to Perk. Thank you Perk . . .